The cockatiel is a lovable, intelligent bird which you must want to add into your family member. However, before deciding to pet this happy, social small-crested members of the parrot family, you should know the guides on how to take care your first cockatiel healthy. Here are some guides to help you learn what your cockatiel needs in order to be healthy. First of all, it is important for you to consider the habitat of a cockatiel and what kind of housing suits them the most. Since cockatiel likes to move around, you need to provide a large cage for them, the bigger the cage the better for them. 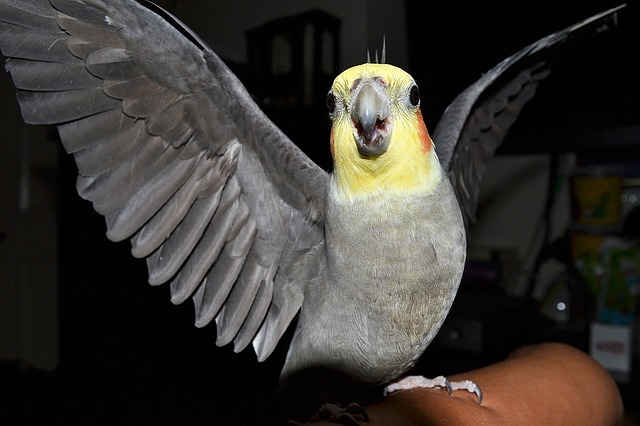 The large of the cage should be at least twice the size of your cockatiel’s wingspan. In addition to the cage, you also need to provide a mixture of perches for them. The existence of perches is essential since cockatiel is the type of bird who relies on their feet the most, even when they are sleeping. Therefore, to keep their feet healthy, you need to provide perches made of different materials in varied diameters. If you use wood for their perches, you should make sure that they are safe enough. Besides, it is important to keep their cage clean and disinfectant. Replace perches, dishes, and toys when they get torn or damaged and make sure that the habitat part does not have zinc, lead, or lead-based paints as these will cause a serious medical issue for your bird. Please also note that you should avoid using cleaning agents around your birds. It is recommended to use a natural cleaning product when cleaning the cage and its accessories. Besides the housing, you should also pay a detailed attention to the food that you give to your cockatiel. It is important to ensure that the cockatiel gets the right nutrition they need. The easiest way is to give them primarily food pellets made for cockatiel. Since you also need to give them varied diet, you also need to provide them with a variety of seeds, fruits, and vegetables. Spinach, broccoli, collard greens, bananas, apricots, and oranges are examples of food good for cockatiels. However, you should also be careful when feeding your pet as there are some food which are toxic for cockatiels, such as avocado, chocolate, fruit seeds, onions, garlic, alcohol, mushrooms, honey, salt, caffeine, dried or uncooked beans, and rhubarb. Please also note that you should never feed them with any high-fat, high-sodium, or high-sugar foods and foods advertised as ‘sugar-free’ as they can contain Xylitol. Please also keep in mind that there may be some seed husks which your pet left in the bowl. Therefore, you should empty and refill their bowl frequently. Just like human, cockatiels love toys as well. They are pleased to use their strong beaks to chew and shred their toys into pieces. This is due to their natural, wild instinct to forage and it is important to maintain that instinct. There are many types of toys which are perfect give to your cockatiels. They love playing with toys made of wood and ice lolly sticks and balsa wood toys. You can also give them toys made from palm or raffia strips, twig balls, and vegetable tanned leather strips to make them happier. Keeping them happy is one of the ways on how to take care your first cockatiel healthy. Hand in hand with the healthy diet, giving your cockatiel clean water to drink is also important to keep them healthy. Therefore, it is important to get their water changed daily or when you find some droppings into it. It is recommended to give them the same water you drink, not from some random water sources. Changing the water is not enough; you also need to wash the water bowl cleanly. Just like you wash your dishes, it is suggested to wash the bowl with hot water and a drop of soap and rinse it thoroughly. By doing this, you can avoid harmful algae and fungus growing in the bowl. Cockatiel has a long life span so once you decide to take this bird home, they will be your lovable family member for a long time. Therefore, it is a must to get them bathed frequently, just like you and your other family members; they must love this activity. Bathing will not only make them happy but also make their skin moist and feathers clean, especially since they are dusty birds. To monitor their health, you should take them to the avian veterinarian for a well-bird exam. This should be conducted annually and regularly. Besides, it is also a must to bring them to a veterinarian immediately if they start showing signs of sickness. In this case, you should really pay detailed attention to them since cockatiel tends to conceal their sickness until it becomes severe. You should be suspicious if you find your cockatiel start being cranky, napping more often than usual, not willing to eat or drink, sneezing, coughing, or experiencing weight loss. Besides, the signs of sickness can be seen from their irregular breathing, lameness, inflamed eyes, cloudy eyes, and dropping head, wings, or tail. Once you find these symptoms, you should hurry to bring them to the veterinarian, even though it may cost much. The last but not least thing to know about is that cockatiels may have night fright. Some of them may be afraid of dark, which may cause them freaking out. Therefore, it is essential that you have some lights on in the room where your cockatiels are and never cover their cage, especially at night. Please also note that you should put any toys away from the perches where they usually sleep in. This is to prevent them from getting tangled up in a toy when they have a night fright. The seven guides above are the basic guidelines to help you take care of your cockatiels. Now, after knowing how to take care your first cockatiel healthy, you are ready to take a cockatiel home and love it like you love your own family member.